If you see this picture, probably it’s pretty easy to understand. 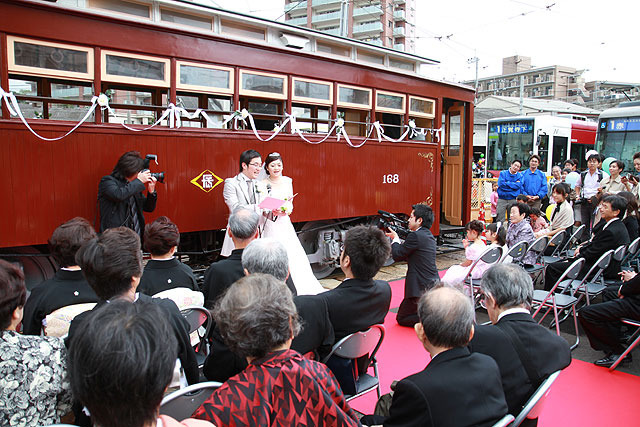 Yes, a wedding ceremony was held on the street car. Do you know “Railway Otaku”? 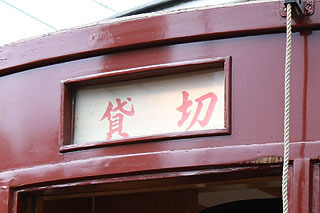 It’s a Japanese name of kind of persons who really like railways and trains, they are also called as “Railway mania”. It seems there are many railway manias worldwide not only in Japan, probably there may be thousands of them in your country as well. One day, the writer of this article were invited to a unique wedding ceremony by his friend who is an enthusiastic “Railway mania”. 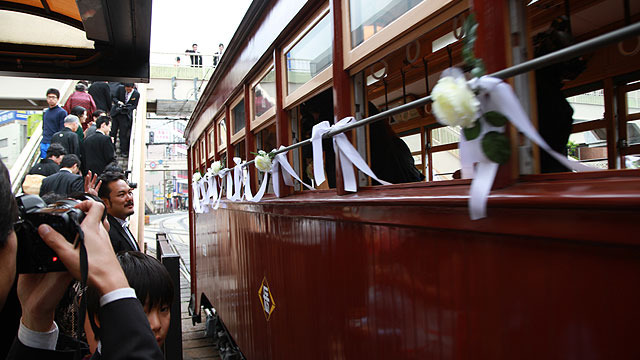 The ceremony was held on the street car on their way to their party place. I will introduce his report of his joining the unique ceremony. Can you see the bride and groom appeared across the rail track? 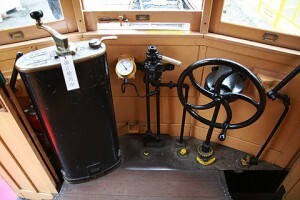 The start point was at the terminal of the street cars. They are welcomed by many relatives and friends. 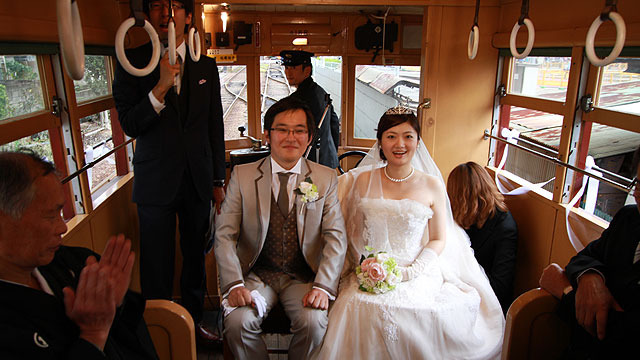 The groom is Mr. Takashi Nagano, who is known as “Railway mania” in this region, and the bride is Ms. Yuko. 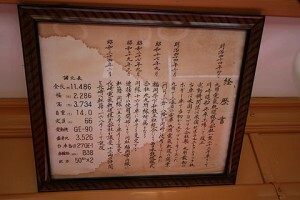 He has experience that he has travelled and took all the JR(Japan Railways) line in the nation. 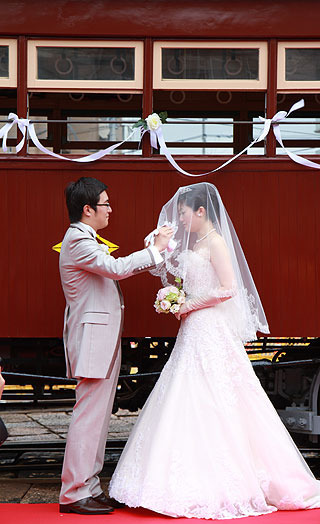 The writer knew the groom is an enthusiastic railway fan, but didn’t imagine that he holds such style of ceremony. 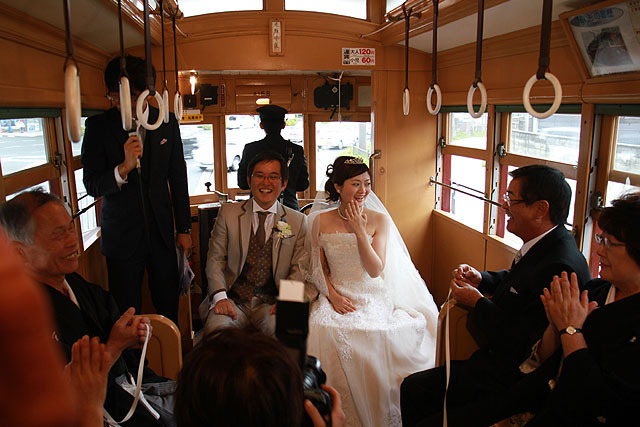 Saying their vows in front of the tram…. The oath kiss in front of the tram. The balloons flying between the electric wires. 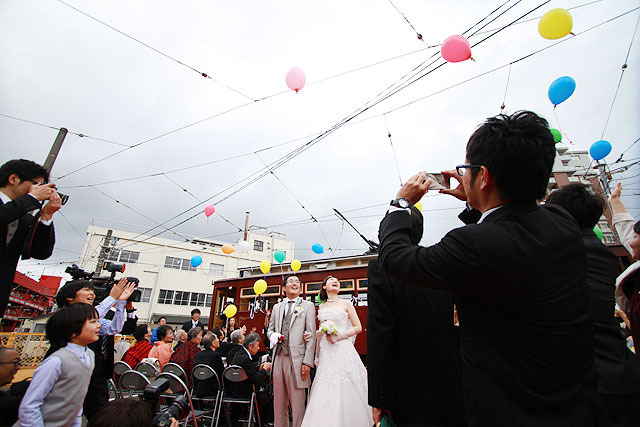 The ceremony is completely their original idea, which nobody has experienced before. Colorful balloons flying over the street cars and terminals, and the place was surrounded by the happy atmosphere. All the participants got excited about such a nice unique ceremony, even though the weather was not so nice. After the main event, the group got on the old street car stood behind them. 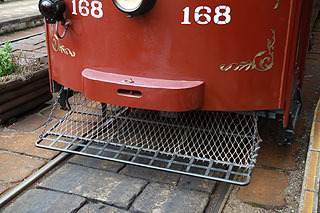 The street car was made in Meiji era. The driver’s place. No.168 of the 160th form. It’s one of the oldest, and the sole wooden tram in the nation. All the people there including the groom, of course, were so excited about riding on the valuable vehicle. 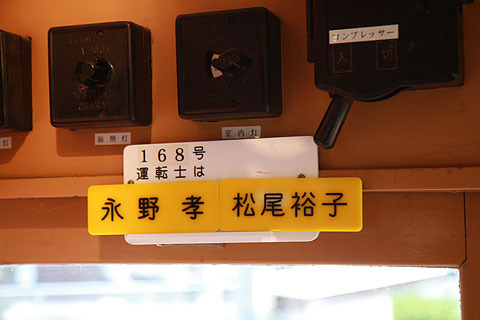 Both name of the bride and groom on the driver’s name plate. The couple were exciting and smiling all the time. Participants were also enjoying the ride. Everyone was taking photos of the couple and inside the tram. Local TV station was also there and taking pictures. The street car runs on railway tracks feeling the wind, and goes through the center of the city, heading toward the party place. 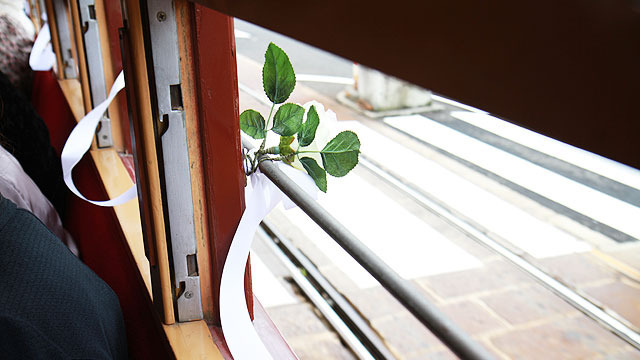 White roses were put the outside of the tram. 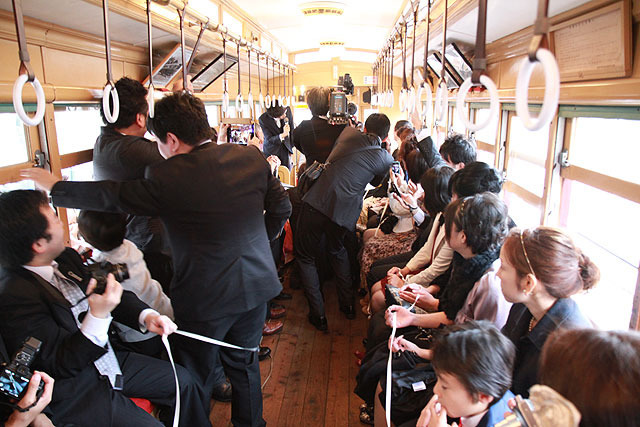 The old retro-style tram might be looked at the people outside. Pleasant breeze made us more comfortable and brought us happy atmosphere. 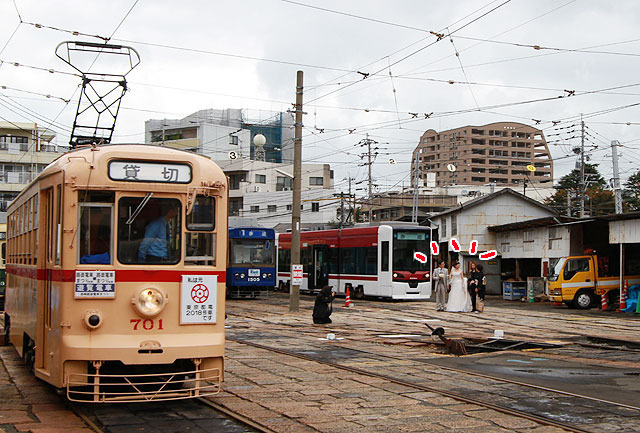 After a while, the street car arrived at the destination of “Nagasaki-eki mae (In front of the Nagasaki Station)”. People seeing from the pedestrian overbridge. The happiest street car in Japan at that moment was welcomed by many people at the station. The passengers got off the tram and headed toward the party place with happy feelings. Now we have seen a nice unique wedding ceremony in Japan. What do you think? I’ve never seen like this unique event, and I think it would be unforgettable experience for all the participants. I’m happy to see this through the blog, and thank the writer for introducing such happy pleasant ceremony.